i don’t like the idea of carrying a gun. as clumsy as i am, it’s going to go off at the wrong moment and will be aimed in the wrong direction. as in middle of church services and me. pepper spray? my eyes still well up at the memory. but, still, i am now packing heat. i figure i’m traveling a lot–something untoward will perforce happen. i have placed in my purse a wooden board. it’s roughly the size of my laptop. inch thick. and i’m utterly deadly with it. stand back. be afraid. be very afraid. i’ve known f2fb friend #87 ron stein for roughly 18 years. that’s because i signed up my older son joseph for karate lessons. i thought being comfortable about defending one’s self is always useful–especially in the mean playgrounds and candy stores of winnetka. ron teaches karate at the community house with frank crzysnowski. both joseph and eastman trained for years with the duo. ron now also provides private lessons to anybody who wants to feel confident about their safety. and he was kind enough to come to the house to give me a private lesson, having expressed some concern that this year, i’m sure to run into some questionable circumstances. ron knew he couldn’t get me up to bruce lee standards, but he could tell me the most important things a woman should know. first, be conscious of your surroundings. a lot of times i’m pretty ditzy but when i pay attention i have good instincts about when something is not quite right. not that i act on that instinct, although that brings me to . . . .
i’m hideous at making the decision to cut off the ladylike behavior. to breach the social compact. to say “i don’t care if i hurt your feelings.” there is a moment when i should strike, and in the next several seconds, as the miscreant is reacting in surprise, i should make my escape. ron said that every female he has taught has been able to slice up a board on the first try. the pressure was on. but what this exercise would teach me is just how much power i can bring to a situation. he had me focus on the exhalation, breathing out at the moment i strike. putting my whole self into that impact. allrightee!!!! * oddly, i didn’t even break a nail! 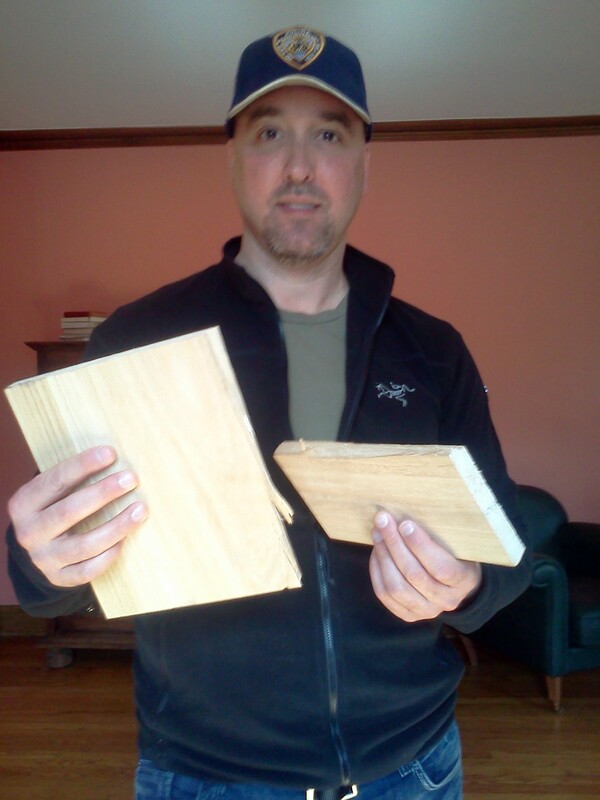 in fact, my only injury was a splinter i got from jumping around screaming “i did it!” while brandishing the two pieces of wood. if i can strike like this at an aggressor’s chin or neck or eyes, i have just given myself enough time to either flee or to follow up with a damn good knee to the groin, the latter of which ron seemed to hesitant to have me demonstrate. this showed me, though, how much power the weaker person has in any situation if they make the decision to forget appeasement, negotiation, charm, etc. ron has spent a lot of time in japan and like me wants his japanese friends to know 私達は覚えていてあなたおよび私達がであることをあなたのために考え、祈る! *special thanks to f2fb #28 tom evans ace camera dude! This entry was posted on Sunday, April 3rd, 2011 at 8:36 pm	and tagged with breaking boards, bruce lee, facebook, karate, ron stein, self defense, tom evans and posted in Uncategorized. You can follow any responses to this entry through the RSS 2.0 feed. « the days ahead on f2fb! You’re a mean, wood-wielding machine, woman! LMAO re: “I’ll just take out the board and say ‘hold this'”. Love it. i will so strike fear into the hearts of the wicked!!! “Pull out the board and say ‘hold this. '” I wish I could insert a picture of any old critter holding its sides, rolling in pain with laughter and wiping the tears from its eyes. RACCOONS DO IT ALL THE TIME!! !